The ‘Prism’ Focus features a shimmering paint job which creates a ‘Prism’ effect when hit with direct sunlight or a bright light. Painted in-house and coated with our durable Pro Clear finish. The ‘Prism’ finish looks different depending on the light you’re viewing it in. You’ll notice that in the main photo which was taken outside, you can clearly see the circular ‘Prism’ while the individual photos which were taken in our photo booth have less defined ‘Prism’ circles. 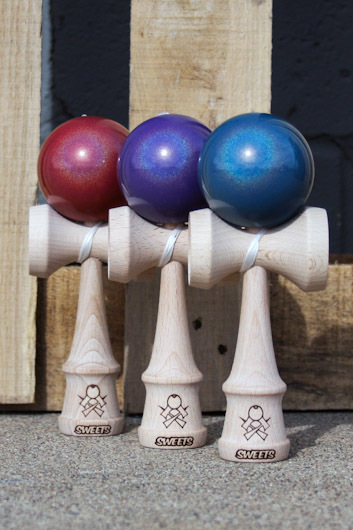 Every Sweets Kendama comes packed with an extra string, bead, instructional book and stickers.